The year that you turn 70 1/2 you're required to make a minimum distribution from your retirement plan account. This applies to any IRA, profit sharing plan, 401k, 403b, 457b, or SEP IRA. If you do not make the required withdrawal, you will be penalized a 50% tax on the amount not withdrawn. To calculate the required minimum distribution that you're required to make each year, the IRS publishes its own worksheets. Each year, you must withdraw a larger percentage of your retirement accounts. For example, if you just turned 70 1/2 this year and you have an IRA with $200,000 and a 401k with $300,000, you would calculate the minimum required distribution on each account and add them together. For the $200,000 IRA, you would be required to withdraw $7,299, or 3.65%. For the $300,000 401k the required distribution would be $10,949, also 3.65%. In total, you would be required to withdraw $18,248. You have the option of withdrawing this money from any of the retirement accounts that you desire. As you get older the percentage of retirement assets that you need to withdraw increases. 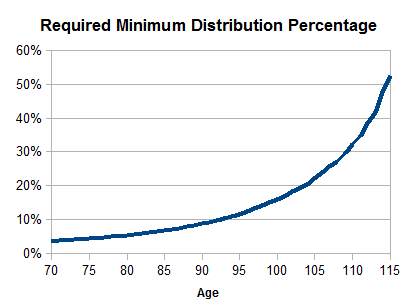 We've put together a chart below that shows the required minimum distribution percentage as you age. As you can see, at age 70 the RMD is about 3.7%, at 90 it is about 10%, and at 100 it is 15%. At 110 it rises to 30% and then to a maximum just over 50%. Although the increases seem like a lot, if you factor in the increases in your retirement account assets, the actual dollar amount of the withdrawals may or may not increase. For example, if you have $1,000,000 in retirement accounts and have to withdraw 3.65% at 70, you would take out $36,500. However, from year 70 to 71, if your account grew by 5% it would now be worth $1,011,678 ($1,000,000 - $36,500 + 5% growth) and your 71 withdrawal would be 3.77%, or $38,176. However, if your retirement savings did not grow, then your account would be worth $963,500 and the age 71 required distribution of 3.77% would be $36,358, which is a few hundred dollars less than the required withdrawal at age 70. So, even though the percentage rises some each year, if your account value decreases then you will not have to withdraw more. The good news is that if you earn more than the required withdrawal percent on your retirement account assets, your overall account value will still grow even after the required withdrawals.